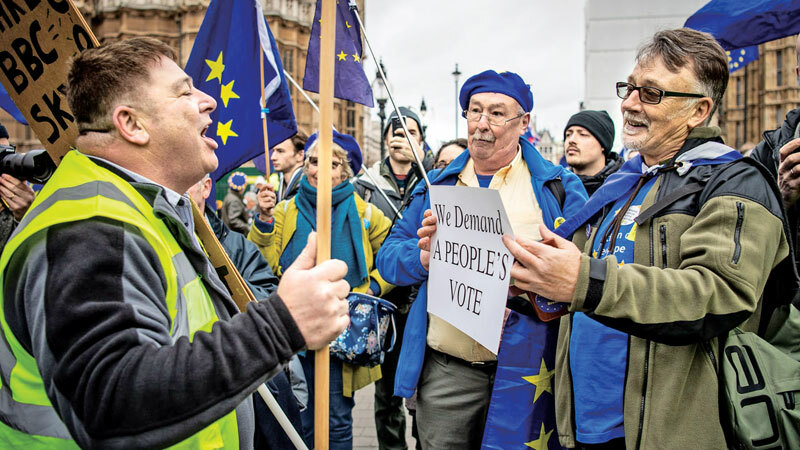 Pro and anti-Brexit protesters clash outside Parliament. Critics say Europe will accept neither an extension nor another renegotiation. My 13 years’ experience of bargaining with European leaders suggests the opposite: that if we have a plan and a timetable resulting from this process, they will come to welcome it for its openness and realism. To those who say another year of uncertainty would lie ahead and would be destabilising, I would answer that uncertainty is already sadly with us in every scenario. Even if there was a deal, we are only at the end of act one of this European drama: the withdrawal deal. Still to be addressed are act two – the transition; act three, the negotiation of our future European relationship; and act four, the renegotiation of our relations with the rest of the world. So we can approach the future either through more and more attempts at short-term fixes that fall apart under scrutiny, or by purposefully and constructively engaging in a systematic and structured national conversation to find common ground.